The imaging room is equipped with modern equipment, which ensures quality images enabling a fast, concise diagnosis. 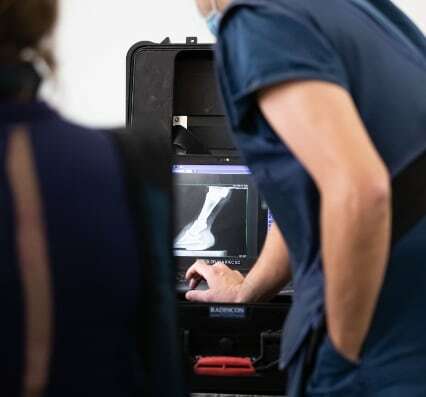 Digital Radiography is useful for diagnosing and monitoring conditions involving bones as well as certain soft tissue conditions, particularly those related to the chest and abdomen. Endoscopy allows the Veterinarian to visualise anatomical structures and is a key diagnostic tool in the diagnosis of many conditions. Video endoscopy is available at WestVETS Veterinary Practice, maximising the Veterinarian’s view. Ultrasound is a valuable imaging tool for evaluating and diagnosing many different conditions and monitoring healing progress. Ultrasound can be used to evaluate abdominal and chest pain, cardiac disease, as well as anatomical sites with a mass or swelling.